Well, admittedly, that shot doesn’t really give the full effect of the experience. 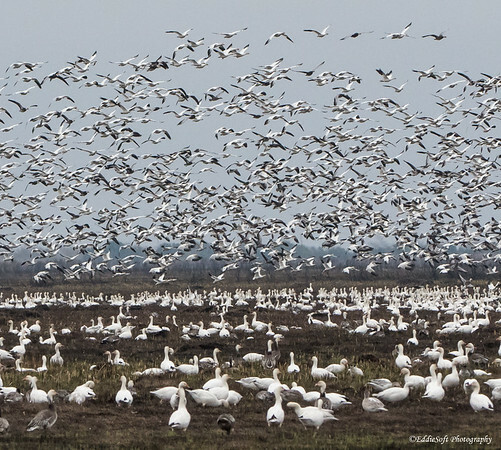 It does give a better view of what made up this huge flock of birds we saw on our trip down to Anahuac National Wildlife Refuge along the Texas Gulf Coast over Christmas break 2017. If you recall, our first unique encounter this year at Anahuac was the Zebra (link here). Kind of hard to really top a creature more commonly seen at the Serengeti National Park than off the Gulf of Texas. However, a close second had to be witnessing one of the largest massing of birds I’ve ever encountered. Apparently those three Snow Geese above have a VERY large number of friends and relatives who flew in for the holidays. 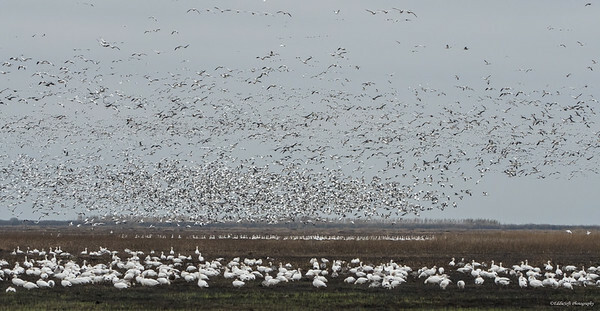 Definitely not an experienced bird counter (or estimator in this particular instance), but comments from the rangers and an article in their refuge flier indicated it was 10’s of thousands strong. Sure felt like even more based on the number on the ground and the numbers that were taking brief flights. We found this flock at the end of the road that leads into the main part of the park. Last year we skipped going down to this point fearful of the road conditions. Part way down, the road turned into gravel. Getting the larger vehicle stuck would definitely put a damper on the day. This year we asked the ranger at the visitor center if we could make it down there – turns out it is actually a pretty solid base and handled the weight of the vehicle with zero issues. Excited about the chance to explore a new part of the park we headed down to the boat ramp situated at the end of the road. In passing the ranger mentioned that we would see the Snow Geese down there. Since I already had the Snow checked on my list, that initially didn’t generate the enthusiasm it should have. Now if he would have said “that is where you will be able to feel the wing beats of thousands of birds… a whole different story. When we reached the end of the road, we almost missed them … if you can believe it. We circled near the boat ramp looking for anything interesting that might be in the water. Disappointingly, there was very little out there – definitely nothing worth bring out the Beast for. Now turned around and pointed back out, we noticed a couple out of their car looking out into the field across the road from where were. Now that could be interesting. Sure enough, they were looking at the Snow Geese that had somehow escaped being noticed on our first pass. Might be due to the fact we had traveled from Illinois and the snow white ground was an expected sight being the middle of winter. EXCEPT WE WERE IN TEXAS! In our defense, the weather was exceptionally cold the week we were down there, really only reaching above 50 only once the entire week we were down there. Still not cold enough to explain snow. Not to mention snow doesn’t usually fall up. Ended up getting out of the RV and walking over to the side of the field. There I was able to not only see the Geese, but also feel them. At random times sections of the flock would take flight and carry out some spectacular aerial acrobatics and then eventually land back into the field. When they took flight, you could feel the pressure built up from the wing beats – think of your amp turned up to 11. Absolutely amazing. Motioned for Linda to get out of the van to share the experience, but our hand signals were not properly planned out – she ended up staying there, but was able to feel and hear them through the rolled down windows. I now know how it must feel in North Platte, Nebraska when the Sandhill’s launch. Goes to show you, even though you might have that little check mark from a previous encounter with a bird, there’s always something new to discover every time you get the chance to see them in the field. Chalk this up to one of those meetings I’ll never forget. Huge geese flocks are a great sight, here in Norfolk UK we get about half the world population of Pink Footed Geese overwinter, that’s around 90,000 birds! they feed in fields of harvested sugar beet in flocks of several thousand and roost on sandbanks just off the coast, always look forward to their arrival in October. Wow, 90,000 specimens of a bird I’ve NEVER witnessed – jealous. I had to laugh when you pointed at the Pink Foot remembering it being brought up in the Big Year movie and having made a note to myself to put that bird on my list! That must be a wonderful sight to see and guessing like in my encounter, something to hear as well. If you haven’t put them on your website yet, will look forward to a post on it from you this October. As always, appreciate you dropping by and commenting. Yes I must try and do a post this year, they are however very hard to photograph! (easily spooked) best to use the car as a hide and hope the roads are quiet! Surprised you’ve not seen any as they are as close as Greenland, and those birds often bring a Snow or Ross’s Goose with them here. I remember that movie! good laugh, bit like that in this Country but sometimes gets nastier, one reason I don’t do twitches anymore. Very cool! I believe we once saw three or four Snow Geese at Emiquon in Havana, Illinois, with one of them a blue morph, but that’s the most I’ve ever seen. You and I saw them a second time there, and in fact that may be the only place I’ve ever seen them, but I did read that there were thousands of them there in the early spring of this year. And these are pretty large birds! I didn’t know you could feel them taking off. That must be a memorable feeling. Let’s see, I found some facts about the Snow Goose from sites online. Their population was reduced to only 2,000-3,000 around year 1900–now 400,000 a year are hunted. They form four North-South corridors for migration. The “Blue Goose,” long considered a separate species, is now known to be only a color morph of the smaller race of Snow (Lesser Snow Goose). The two color phases are variations within the same race and do not indicate separate races. The older misunderstanding is probably why I see obsolete names of blue goose and blue-winged goose. The two color forms mate with each other, and may produce young of either or both colors. A larger race, Greater Snow Goose, nests in far eastern regions of Canada and winters on the Atlantic Coast. The call is a harsh, one-syllable “whouk” (whatever that sounds like), harsher than other geese. Their noisy, high-flying “V” shaped flocks sound like baying hounds. Are you rubbing the Ross’ in my face!!! Some people bring you all they way up to Chicago under the guarantee I could get one of those in tin – even provided a validation the week before I came only to go no-for on our multiple trips through. Of course these things happen – if it was easy, it wouldn’t be as fun … although I did produce the White-Faced Ibis for you, so you kinda owe me. Thanks for all the additional facts – I went a bit light on them on this post focusing more on the experience as the takeaway. 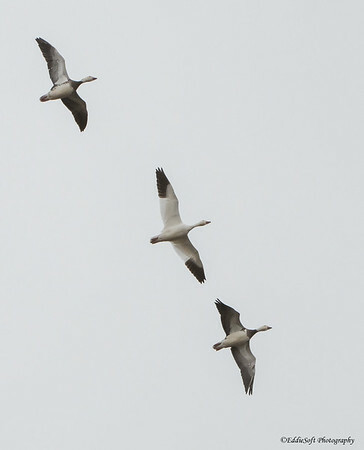 I do remember those three we saw at Emiquon – they have not been seen this year (at least by me). Hope nothing happened to them, they were quite a cute couple complete with the Dark Morph. Thanks for stopping by and commenting. Catching me off guard with this short comment to post spans. Yes, I was excited to get pictures of a White-Faced Ibis at Emiquon last month! And I do feel bad about having you drive 2 hours only to miss the Ross’s Goose that had been there for over a year and a half and that I had recently verified was still there. But you did get pics of a Hooded Merganser near there, which made me feel a little better about it. BTW, the town of Wilmington that we went to for the Ross’s Goose is 60 miles from Chicago, and in fact it’s even south of I-80 that is your unofficial border of “Chicago”. In addition to the Snow Geese, you are also the reason I have pics of Black-Crowned Night Herons (the coolest bird name ever), Eurasian Tree Sparrows, Western Kingbirds (on our second try), Red Phalaropes, my first Yellow-Billed Cuckoo and countless other birds, as well as that crazy snake with the catfish in its mouth. So I’m behind in returning the favors. Id did a quick poll (asked Linda) and she agreed that was Chicago so that pretty much settles that debate ha. Yes, I did get the Hooded Merganser which was a very adequate replacement for the Ross’. Weird how I could never find one and then that day we came across multiple at multiple locations. Did you have the Scissor-Tailed Flycatcher before the one we saw in Havana? – that is still one of my favorite birds to date (along with Spoonbills hehehe) and still can’t believe it decided to hang out only a lonely country road in the middle of nowhere. Thanks for reminding me again – I need to get those snake pictures processed it – in fact, we even saw another snake on our last visit to Emiquon a month or so ago – that place is one hot spot for birding … and now snaking. Thanks for coming back and commenting!